What goes on four legs in the morning, on two legs at noon, and on three legs in the evening? The solution: A human, who crawls on all fours as a baby, walks on two legs as an adult, and walks with a cane in old age. Half our sticks are sold to collectors and the other half to users. Florida imagery while others prefer a more random variety. creates a special identity for the user/owner. Should you like to commision an item contact us. 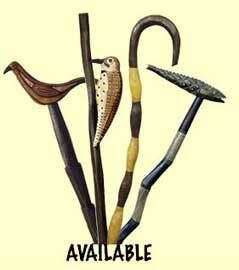 Available canes can be purchased via paypal through this site. Third Leg is one of many arms of the South Jersey Museum of Curiosities, also known as SJMOC LLP. using an ugly medical device. We thought the same concerns were probably true for others. and the Evanston Craft Exposition. 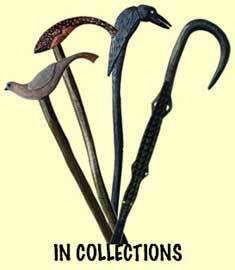 Our collection of canes and sticks was exhibited at Moore of Art and Design, Philadelphia, in 2003.